Could Amazon Fixation Cost Virginia $1 Billion Micron Expansion? Nyah! Nyah! Come and get us! When semiconductor-maker Micron Technology Inc. approached economic-development officials in Virginia about a tax-incentive package for a $1 billion expansion of its Manassas site, it got the cold shoulder. With 1,800 employees, Micron’s Manassas, Va., microprocessor plant is one of the area’s largest employers. The plant is expanding to meet increased demand—particularly in the automotive industry, for which the company produces memory-storage devices, said a person familiar with the matter. Stephen Moret, CEO of the Virginia Economic Development Partnership, which is mostly publicly funded, declined to comment on the specific negotiations with Micron. In an email, he said the group heavily relied on consultants to aid it in its Amazon proposal. “Consequently, we don’t think there has been an opportunity cost to our HQ2 efforts, other than the financial investment we made in third-party support,” he wrote. He declined to say how much the state authority spent on its HQ2 bid. Bacon’s bottom line: I have long been ambivalent about Amazon HQ2. Admittedly, a major Amazon presence in Northern Virginia would be transformative, spurring a much-needed diversification of the economy away from the federal government. But the sheer magnitude of a $5 billion investment and hiring of 50,000 employees would disrupt regional labor markets and create enormous population and development pressures which state and local governments would be hard-pressed to pay for, especially if tax breaks and subsidies were needed to clinch the deal. Better to aim for projects that are big by any non-Amazon measure such as a major facility expansion planned by Apple, I have argued. Better yet to win projects, such as Micron, which by all logic would locate in Virginia with only a modest effort. Hopefully, Virginia’s economic developers can rescue the Micron expansion, as I am confident they will. A loss to New York, a state from whom Virginia has been draining investment from for decades, would be humiliating. While Northern Virginia arguably has as good a shot as any competing region at winning Amazon, let’s face it, snagging HQ2 is a long shot. NoVa is one of 20 regions competing for the business. To re-tread an old metaphor, we can take the bird in our hand or go for two in the bush. With the economy at full employment, I’d happily settle for the bird in hand. Because Micron is one of our largest traded-sector employers, they interact regularly with VEDP staff members and other state officials. Including a plant tour back in February, several in-person meetings with Manassas and/or headquarters officials of Micron, and many phone calls, I’ve personally talked with Micron at least 15 times since late last year. I’ve interacted more with Micron than with nearly any other company that has operations in Virginia. Also, in regard to Amazon HQ2 incentives, Moret said in an email response to the Journal: “We would be thrilled for HQ2 to locate in Virginia, but our efforts to date relative to HQ2 will produce a positive ROI for Virginia whether or not we secure HQ2.” Read the full text of that email here. This entry was posted in Economic development and tagged James A. Bacon. Bookmark the permalink. I thought the comprehensive approach that Virginia took with Amazon was general enough that it would also benefit other tech companies and I’d not like to see specific favoritism towards Amazon NOR Micron as I tend to hew to Jim’s worries about unfairly assisting one over the other so it’s hard to tell if Micron got treated unfairly or wanted “more” and now is using the WSJ to bolster it’s position. 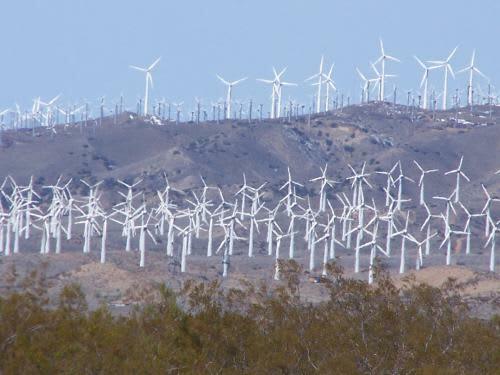 You can google Tehachapi Pass Wind Farm to get info on their “technology” .. it’s a town of about 14,000 born from the expansion of rail… as the country moved westward. Talking to the Wall Street Journal is a very hardball tactic on Micron’s part. Interesting. Larry, I last crossed that mountain range in 2009, on a sentimental final journey to Edwards AFB with my Dad, He of the Right Stuff (engineer, not pilot). There might be even more turbines now than then. Drive to the eastern side of Edwards and check out the incredible solar plant. Thanks for the tip Steve.. will look that way! This IS the landscape suited to both solar and wind! I suspect between the two – there is ample power for the town plus more! Big Sky and a lot fewer trees than in the East! We sit at 4000 ft where the temp now is about 60… east of Bakersfield which was 105 coming through there yesterday; it’s the only way East after departing Sequoia! The fixation on Virginia by Amazon may be where the real story lies. For example, note this story published May 12 in Washington Biz Journal. “Amazon Web Services is under contract to acquire a large wooded parcel in Sterling for a new data center, or campus of data centers, sources tell the Washington Business Journal. The 107-acre vacant site is located on the north side of Route 606, just east of the interchange with Route 28. The so-called “Centennial Site” is part of Waterside, the 5 million-square-foot planned development covering some 335 acres — the majority of which, 225 acres, is located south of Route 606 on what is currently the active Loudoun Quarries. The entire 335 acres is owned, for now, by Chantilly Crushed Stone Inc., a subsidiary of the Gudelsky Group. A zoning determination request submitted to Loudoun County in early May for the Centennial Site indicates the sale is scheduled to close in mid-June. A Waterside principal declined comment, citing a non-disclosure agreement with a buyer he would not identify. Amazon Web Services did not respond to requests for comment. Loudoun has assessed the Centennial Site at just shy of $16 million. Waterside, approved by the Loudoun County Board of Supervisors in 2015, is entitled overall for 2,200 multifamily. 335 acres for $16m = $47,761 per acre. In Sterling? And that’s with by right development approval for 2,200 multifamily? Looks like about $320,000 per buildable acre or 8X the Centennial Site assessment. Guess there are many different ways to slice and dice a deal. And the truth. Amazon is one of Virginia’s largest private-sector employers, with several thousand jobs in Virginia today and more on the way. We’ve enjoyed a positive working relationship with Amazon for many years. When VEDP and our partners started working on the HQ2 project, we leveraged substantial third-party support to help prepare our proposals to Amazon. We did so in order to provide a world-class response for HQ2 without impairing our ability to support the many other business development projects we work on each year. Consequently, we don’t think there has been an opportunity cost to our HQ2 efforts, other than the financial investment we made in third-party support. In fact, our work on HQ2 has helped us to identify things we can improve to make Virginia more attractive to other tech companies here, as well as resulted in compelling new marketing materials we’ve been using successfully with other corporate headquarters and tech company recruitment projects. We would be thrilled for HQ2 to locate in Virginia, but our efforts to date relative to HQ2 will produce a positive ROI for Virginia whether or not we secure HQ2. Meanwhile, nearly all of our business development team members at VEDP remain fully focused on serving the hundreds of other existing Virginia companies and other firms with which we regularly interact. For competitive reasons and to protect confidential company information, VEDP cannot comment on current or potential economic development prospects. If HQ2 really employs 50,000 people you can spend a fortune and still get a positive ROI. 50,000 @$100,000 per year = $5b. $5b at 5% state tax rate = $250m per year. The present value of $250m per year for 30 years at 3% = $4.9b. And that’s just personal income taxes to the state.